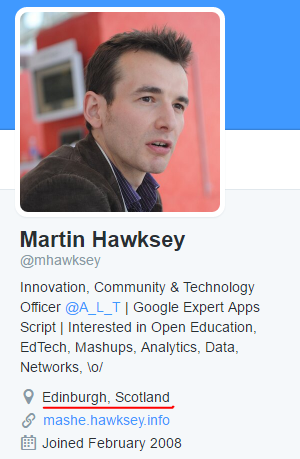 I’m not sure everyone is aware just how much metadata is available to developers in a tweet. 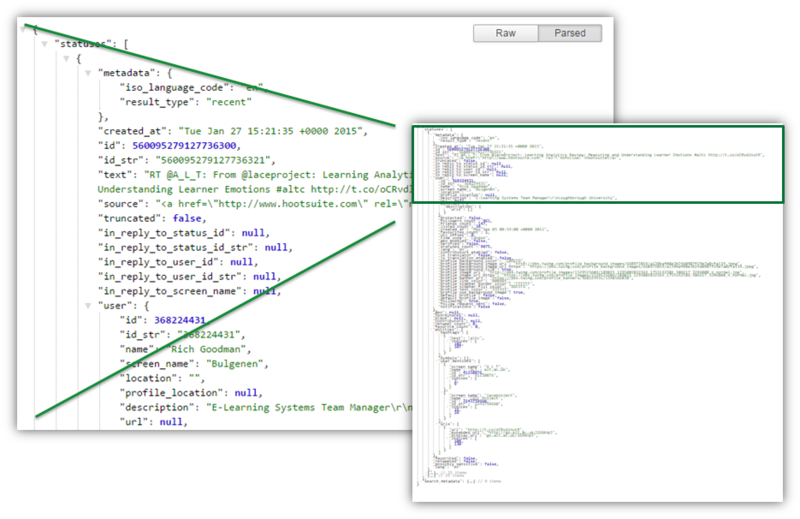 Below is the data (JSON) you get back from a single tweet from the Twitter Search API. Not all of this is particularly useful, including things like profile colour preferences (there’s a research project for you ;), but as well as the tweet text you get information back about the tweet (like who it is in response to), and the user (like their profile description). In TAGS (my Twitter Archiving Google Sheets project) you get a default set of columns which collect the metadata associated with each tweet. Most of these are there to work with the TAGSExplorer visualisation but a lot of people don’t know you can add more column names listed here to your Archive sheet to start collecting other data. 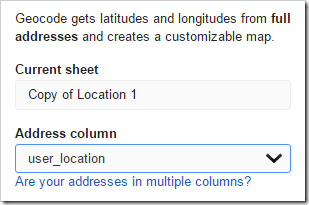 A question I often get asked is when the geo_location column is added why is the data is often blank. The answer is that the majority of people don’t geotag their tweets so there is no data to include (<1.0%). Don’t be allude however that by not geo-tagging your tweet that you are not giving away your location. A 2013 study revealed that approximately 20% of tweets could be reveal the user’s location down to street level (Weidemann & Swift, 2013). One of the authors of that work, Chris Weidemann, has created geosocialfootprint.com “an educational demonstration of how public Twitter.com data can be harvested and analyzed to uncover location intelligence” to illustrate the point. One way a location can be revealed is from the Twitter profile location field. This is an optional text field within your Twitter settings which can be collected in a TAGS sheet by adding a column with user_location. Enter your search term in the Readme/Settings sheet and from the drop down menu select TAGS > Run Now! 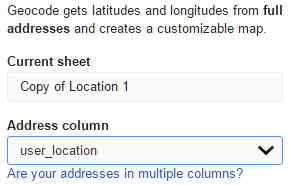 Hit ‘Geocode’ at the bottom of the sidebar and watch has the latitude and longitude columns start to fill. At this point your Awesome Table map is only visible to you and anyone else you have shared your Google Sheet with. 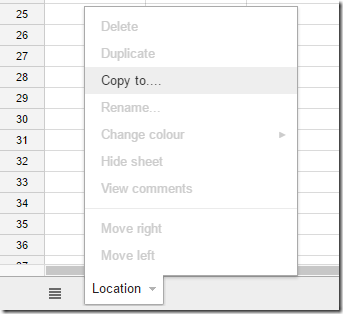 To make public you need to share your Google Sheet so that ‘anyone can view’ from the share button. A couple of things to be aware of. If you set your TAGS sheet you automatically update every hour your map will start putting pointers in the wrong place (this is because the Locations sheet is dynamically populated). You can do a manual update using TAGS > Run Now! followed by steps 3-5 above. Geocoding is also not 100% accurate and co-ordinates returned are the most likely hit. The geocoder also occasionally misses obvious hits … what can I say. 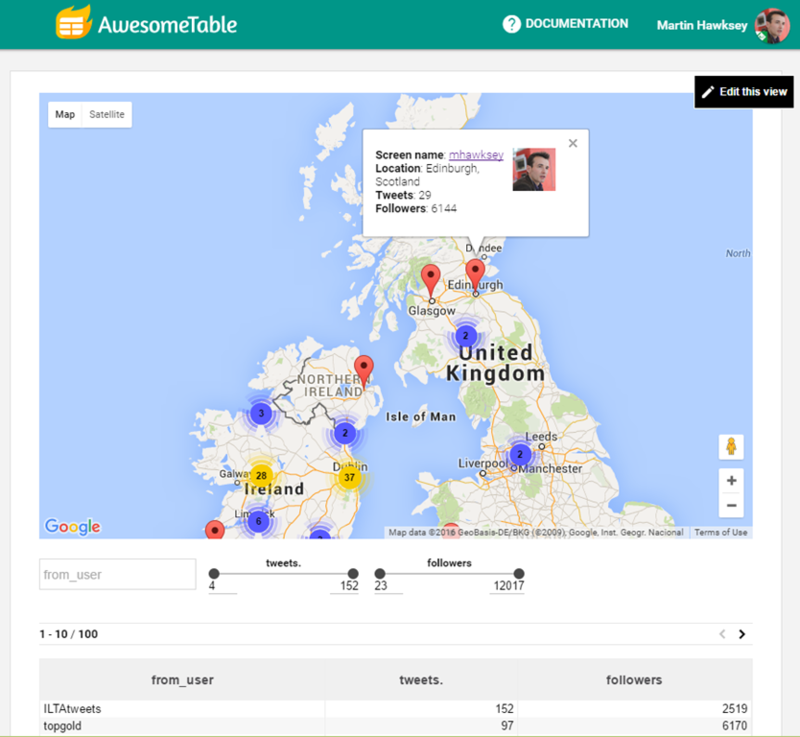 Geocode by Awesome Table will also only geocode up to 100 places at a time. I’ll let you figure ways around this. Weidemann, C., & Swift, J. (2013). 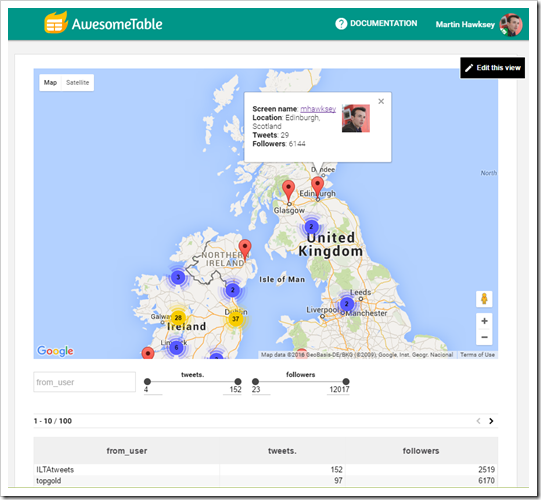 Social media location intelligence: The next privacy battle-an arcgis add-in and analysis of geospatial data collected from twitter. com. International Journal of Geoinformatics, 9(2).